Aaahhhh Ketchup. I like to call it the “convincer condiment”. Have bland potatoes that your littles won’t eat? Squeeze on some ketchup. OH, do you have some meatloaf they turn their noses up at? Try a little (or a lot) of ketchup. Have a piece of liver that they’re refusing to eat? I don’t blame them! But hey, if you smother it with ketchup, you might be able to get a bite or two out of them. THAT’S the power of ketchup. Problem is, some store bought ketchup is LADEN with a cornocopia of additives, preservatives and weird color dyes that you know just probably shouldn’t be put into little one’s bodies (or our own, for that matter). So hey, don’t deprive your babies of the most important condiment in the world!! (to them, anyway). 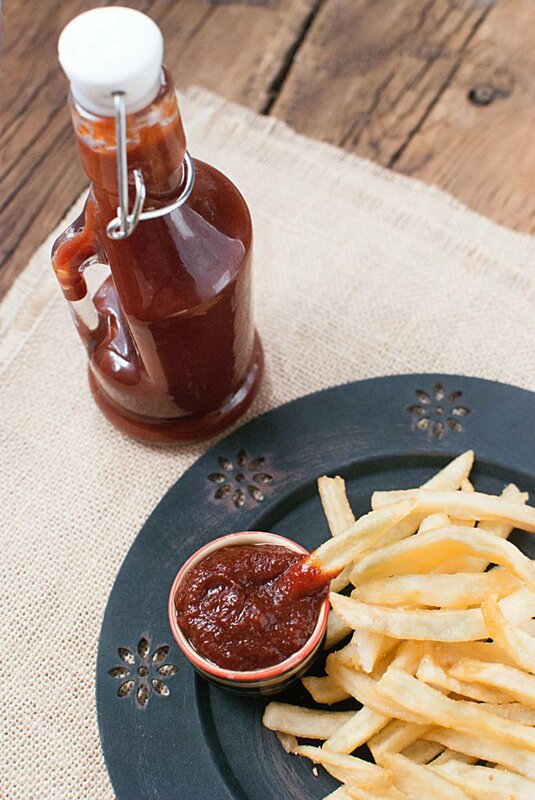 Just make your own homemade ketchup, and make it BETTER than store bought. 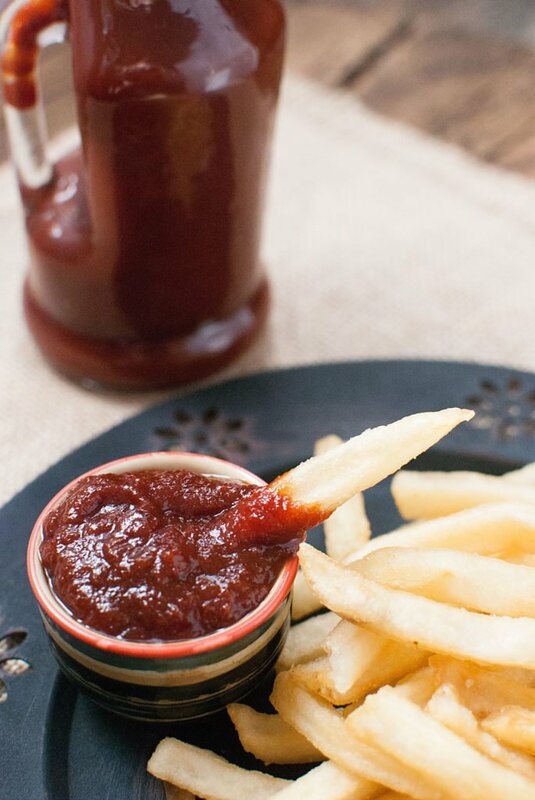 Making your own ketchup is a pretty easy task. ESPECIALLY if you have a good ‘ole crock pot. It’s a matter of putting everything together and then letting it do it’s thing over a few hours! Set and forget it, as they say. Not only does making homemade ketchup give you a peace of mind when squeezing copious amounts of it onto your children’s (or, your own) plates simply because you know what’s in it – but the beauty is that you can adjust this crock pot homemade ketchup recipe more according to your liking. Want it more tangy? Add a bit more vinegar! Like it a bit more savory than sweet with that little “je ne sais quoi“? Add a pinch more clove! It’s all up to you because you’re in control! Honestly though, I find this recipe is the closest I’ve found to replicating the flavor of the “big brand” types, but you’ll have to try it for yourself. Price wise, you might not save a ton of money here if the tomatoes are bought at regular price, but you will save some money. However, the best thing to do is try to find the main ingredient on sale. I say main ingredient because most of the other ingredients you probably already have in your pantry! 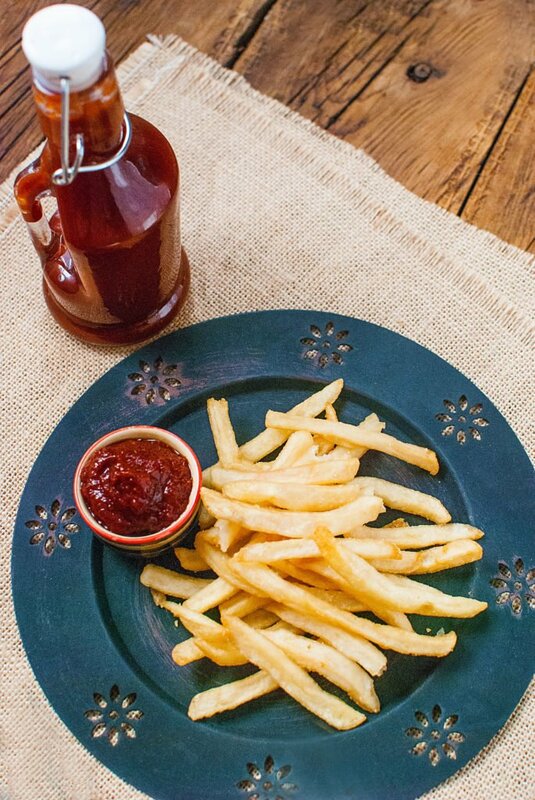 Making your own ketchup isn’t something you would do on a weekly basis…….. orrrrrrr would you? Maybe your household keeps the ketchup makers in business?? That’s ok! So, ok, let’s just say it’s typically not something you’d make on a frequent basis so it really allows you to wait and watch for some great sales. If you find a great price on crushed tomatoes when they go on special, pick up a few more cans than you would need for this recipe! Stock up a bit , so that when do run out, you can take advantage of those savings when you want to make more homemade ketchup! A tasty, easy recipe to make your own ketchup in the crock pot! place on high, and turn the lid a quarter clockwise on the pot, so that it sits crosswise to the bowl, exposing both ends of the cooker. Leave to cook and reduce to a thicker consistency, much like ketchup. Occasionally stir so that it doesn’t burn to the bottom. Cook for approximately 10 – 12 hours or until it’s reached the consistency you prefer. Using an immersion blender (or your own regular blender), puree the ketchup until it’s smooth and the texture you prefer. Spoon into an airtight jar and refrigerate. 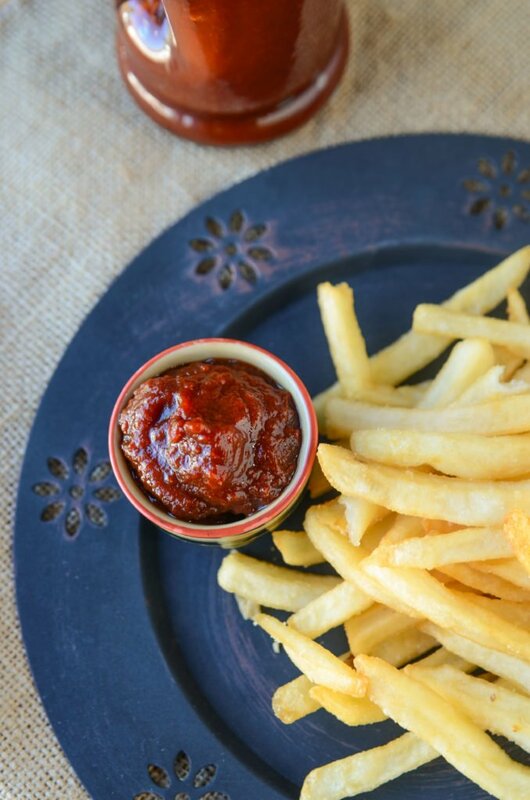 Ok, so when you make this ruby red, tangy and saucy condiment that is worshiped by almost all children everywhere – let me know what you think! I’d love to know if this crock pot homemade ketchup was as easy for you as it was for me, and if your family indeed confirmed that you were a super hero for coming up with something so amazing!